Digital photography: The Jockey Club highly recommends the use and uploading of digital photos. For best results, use a good quality camera capable of producing picture resolutions of at least 640x480. 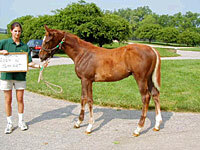 All digital photographs must be uploaded directly to The Jockey Club at http://www.registry.jockeyclub.com. The maximum photo upload size is 10MB. Do not send digital photographs via e-mail, CD, or diskette. Film Photography: For best results, use a 35mm camera. Please DO NOT use a camera that produces instant photographs as these photographs fade to very poor quality over time. Because The Jockey Club refers to identification photographs a number of times over the life of the horse, good quality photographs are essential to ensure proper identification. Only COLOR photographs are accepted by The Jockey Club. 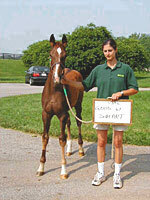 It is important to locate a smooth, flat, dry surface for the horse to stand on when the photographs are taken. Any other surface, such as sand or grass, will prevent our identifiers from checking lower leg markings. 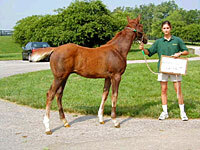 Photographs should be outdoors with the sun at your back, and shadows falling away from the horse. Background is important. For example, you should not stand a dark horse against a black barn. Make sure the horse is clean, dry and properly framed in the photograph. This includes ensuring all legs and markings are visible from all angles, and that the horse is close enough so the markings are apparent yet far enough to include the entire horse in the photograph. Try to stagger the legs as to show a clear view of the night-eyes (chestnuts). When taking photographs, please clean your horse of any dirt, mud, snow, or dust. Please be aware of any item in the photograph which might conflict properly identifying the horse. 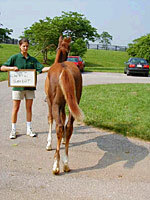 Lastly, for additional identification purposes, a signboard indicating the horse is suggested.